The architecture of the building ensemble, consisting of a front and rear building, advances the concept of traditional modernism, speaking a contemporary architectural language and harmonizing it with the requirements of modern lifestyles. The horizontal arrangement of the impressive street facade accentuates the unique character of each of the building’s levels. The ground and first floors are accentuated by a massive brick base, which lends the entire building an imposing strength and solidity. 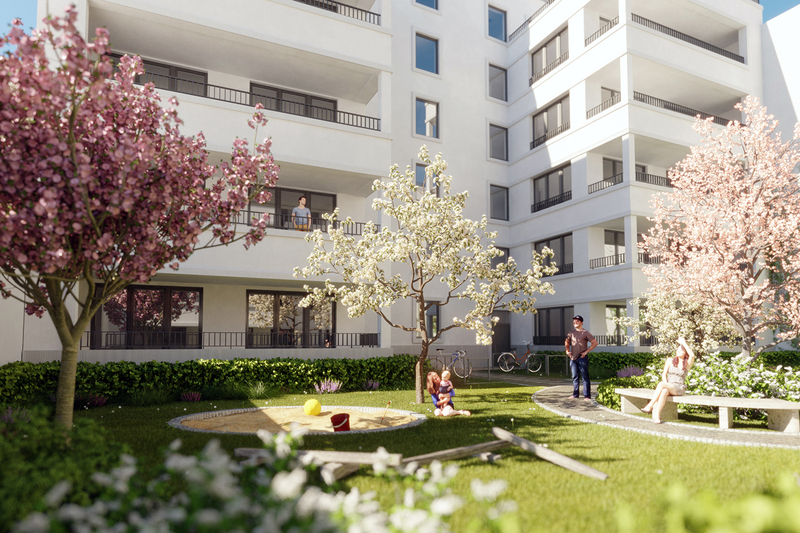 THE WILHELMSAUE 32 CONSTRUCTION PROJECT IS LOCATED IN THE DISTRICT OF WILMERSDORF, IN A BOURGEOIS DISTRICT WITH A DIVERSE INFRASTRUCTURE. The ground and first floors are accentuated by a massive brick base, which lends the entire building an imposing strength and solidity. A fine distinction is made between the facade of the ground floor and the overlying belle étage. All sections of the upper floors are designed to admit plenty of light, with open balconies and plaster facades creating a clear and regular composition. This appearance is enhanced by roof terraces belonging to some of the units. 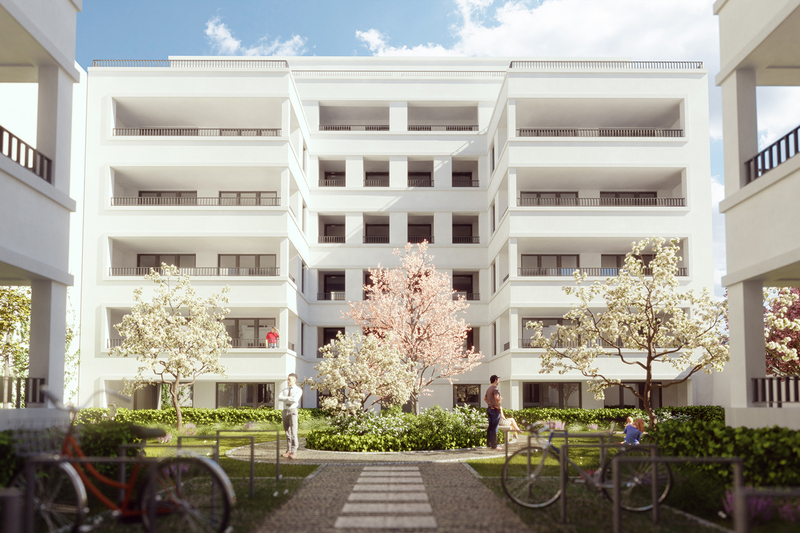 The imposing and carefully orchestrated main entrance communicates the particular importance of Wilhelmsaue32 as one of the district’s pioneering architectural developments. The residential units provide a contemporary answer to the specific requirements of modern lifestyles. There is a vast scope for individual wishes to be accommodated, and future-oriented modifications can also be made. The result is a trendsetting townhouse ensemble, with an architectural concept that sets the tone for the future of urban design in modern European cities. Wilhelmsaue 32 is located near Volkspark Wilmersdorf and Fennsee Lake. On this 1,843-sqm site, a total of 67 apartments of between 31 and 145 sqm are being created. The seven-story front and rear buildings will offer approximately 4,850 sqm of living space. An underground car park is also being built beneath the development, providing 27 parking spaces and a number of bicycle parking spaces. A garden of roughly 220 sqm between the two buildings will offer additional bicycle parking spaces and a variety of play areas for children. Wilhelmsaue 32 is situated in the popular district of Berlin-Wilmersdorf, near the Schoeler-Schlösschen and lake Fennsee. Wilmersdorf is renowned for its abundance of striking Belle Époque buildings and it is also one of Berlin’s greenest districts thanks to its expansive woodlands of Grunewald. Wilhelmsaue 32 is situated in the popular district of Berlin-Wilmersdorf, near the Schoeler-Schlösschen and lake Fennsee. The area around Wilhelmsaue 32 satisfies every conceivable demand. With lake Fennsee and the Wilmersdorf public park, there are two welcoming urban oases in the immediate neighbourhood, providing the perfect backdrop for sports and relaxation. Shopping could not be more convenient, with two shopping streets, Blissestrasse and Berliner Strasse, both within easy reach. Moreover, Berlin’s high-street boulevard, Kurfürstendamm with its line-up of up-market retailers, is less than 10 minutes away by car. Public transport links are equally convenient, with the “Blissestrasse” underground stop just around the corner served by the cross-city U7 line. Furthermore, there is an access ramp to the A100 expressway at Detmolderstrasse, just 3 minutes from the site, putting the countryside around Berlin within easy reach. High-end, classic materials ensure a timelessly elegant fitout. In the living areas, floors feature oak parquetry. Tall doors enhance the sense of spaciousness and permit flowing transitions between the various parts of a given apartment. The solid-masonry walls are given a plaster finish and a bright coat of paint, dispensing with frills of any sort. Analogously, bathrooms emphasize the use of timeless quality materials. Large-format tiles are used for walls and floors, while the reticently styled, bathroom ceramics of the “Duravit Starck3” feature clear geometric lines. The same timeless elegance graces the “Hansgrohe” bathroom fixtures with their classic design. The walk-in showers provide the highest level of quality and comfort.